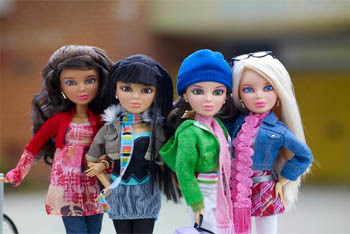 Four new Livworld dolls - Daniela, Alexis, Sophie and Katie - offer girls a fun way to play, with pretty dolls. 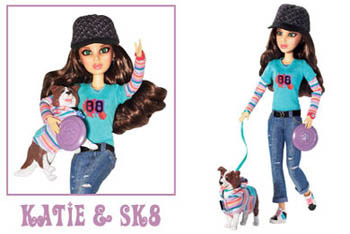 Learn about the new dolls on Kidzworld! 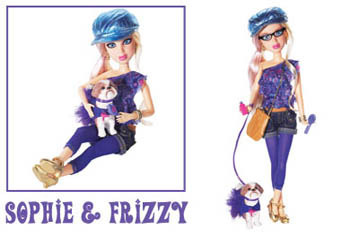 Liv is the name of a new line of teen fashion dolls by SpinMaster toy company. 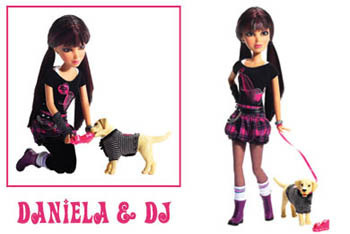 The four characters in the line - Daniela, Alexis, Sophie and Katie - offer girls a fun way to play, with pretty dolls that include easy-to-change wigs, realistic glass eyes and detailed fashions and accessories. 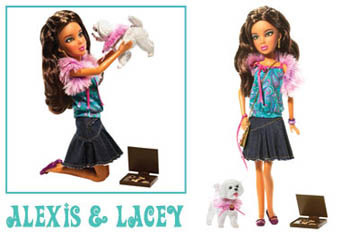 And now, each Liv Doll comes with her very own pet dog! The cool thing about Liv dolls is the special invite you get when you adopt one – a unique access code that opens up an online world and lets you learn lots more about each Liv doll through their personal diaries – as well as play with the Liv virtual closets. Daniela is the life of the party, a storyteller, a natural ham who loves to smile for the camera. Her curiosity leads her to achieve high grades at school. She doesn't have to try too hard either. There's a hint of rebelliousness that comes out when Daniela's performs. Her parents have a serious career track in mind for her as an engineer, but she prefers to break out in song or dance for a full house instead. Daniela especially likes to hang out with her friends, watch movies, play online games, and listen to pop tunes, especially power ballads! She takes her singing career and dance lessons extremely seriously. She performs at the local coffee shop, school dances, and even neighborhood retirement home. Mr. Johnson (age 90) is particularly impressed by her talent and has taken a new interest in pop music! Alexis is stunning and makes a big impression when she walks down the hallways at high school or takes a break for a coconut yogurt swirl at the VeryBerry Yogurt Shop. She's got her own signature style that she nurtures and improves on every day. Reinvention is her middle name. Both of her parents are in the competitive business world. They can’t seem to be able to keep their nanny for more than a week or two, so guess who gets to take care of little brother, Miles? Life would be nearly perfect for Alexis if Miles wasn't always around! :( Alexis loves her job at the flagship clothing store called Possibilities and she's got the best friends a girl could ask for... what else is there? Well there is that pair of fringed suede ankle boots at the new boutique on Level TWO! Sophie is a truly loyal friend and has an immense creative talent. She’s found her "calling“ – Hairstylist to the Stars! She’s a fantastic listener who easily attracts new friends – what hairdresser doesn’t double as a therapist? Her eagerness to experiment with new hairstyles on old friends are both her strength and her weakness – especially when she doesn’t wear her glasses. Her friends want to support her and have a hard time resisting her pleas to “make them over”. The results can be totally fab – everyone gushed over Alexis at the Spring Fling. But they can also leave her friends somewhat blue – wearing glasses while dyeing hair shouldn’t be 20/20 hindsight! Katie thrives on challenges and loves speed so that includes skateboarding, snowboarding, outdoorsy stuff like mountain biking and running. She's way into her friends (obviously!) and loves to read books, especially adventure stories set in fantastic imaginative worlds that take her on spectacular journeys. Katie has a heart of gold, is fun-loving, the class brain, energetic, possesses just barely passable time-management skills and – when not one with her skateboard - can be a bit of a klutz. She's completely clueless to the fact that just about every cute boy in school has a serious crush on her . They don’t see her slightly awkward side. They just see a super talented X-treme athlete! Stylish clothes, lifelike features and tons of cool accessories to choose from! Some of the accessories have tiny hooks and buttons and may be kinda hard to put on and take off the dolls. Which Livworld Doll reminds you most of yourself? Let us know in the Comments section below! What Are These Dolls Called?